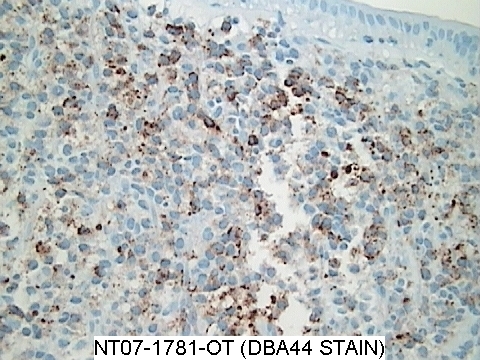 This and other cases can be accessed by visiting our Home Page at www.PathologyOutlines.com and clicking on the Case of the Week button on the left hand side. To view the images or references, you must click on the links in blue. Links in green are to journals with free full text-no registration. This email is sent only to subscribers. To subscribe or unsubscribe, email info@PathologyOutlines.com, indicating subscribe or unsubscribe to Case of the Week. We do not sell, share or use your email address for any other purpose. We also have emails for Pathologist/PhD jobs (biweekly), Other laboratory jobs (biweekly), website news (monthly), new books (monthly), and a newsletter (twice a year). You must subscribe or unsubscribe separately to these email lists. We thank Dr. Michael W. Robles, AmeriPath North Texas (USA), for contributing this case.� To contribute a Case of the Week, please email info@PathologyOutlines.com with attachments of microscopic images (any size, we will shrink if necessary) in JPG, GIF or TIFF format, a clinical history, your diagnosis and any other images (gross, immunostains, etc.) that may be helpful or interesting.� We will write the discussion (unless you want to), list you as the contributor, and send you a check for $35 (US) for your time after we send out the case.� Please only send cases with a definitive diagnosis. 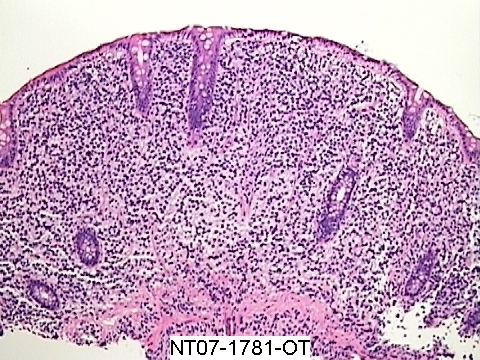 Multiple fragments of nodular colonic mucosa demonstrate mucosal and submucosal infiltrates of small and medium lymphocytes with abundant pale cytoplasm and oval, indented nuclei. �The lymphocytes were immunoreactive for CD20, DBA.44, CD68, cyclinD1/bcl1 (patchy) and Ki-67 (mildly increased proliferation index).� They were negative for CD5.� After the biopsy was submitted, the pathologist learned that the patient had a history of hairy cell leukemia. Hairy cell leukemia is a rare, chronic B cell lymphoproliferative disorder, usually affecting older white men (mean age 52 years), who present with massive splenomegaly with red pulp involvement and obliteration of the white pulp.� There is often pancytopenia (50%) and infections (30%), but usually minimal lymphadenopathy.� Bone marrow aspiration biopsies are often unsuccessful due to marrow fibrosis.� The peripheral blood shows only rare leukemic cells.� Occasional cases may involve the skin or other organs.� GI involvement is rare. 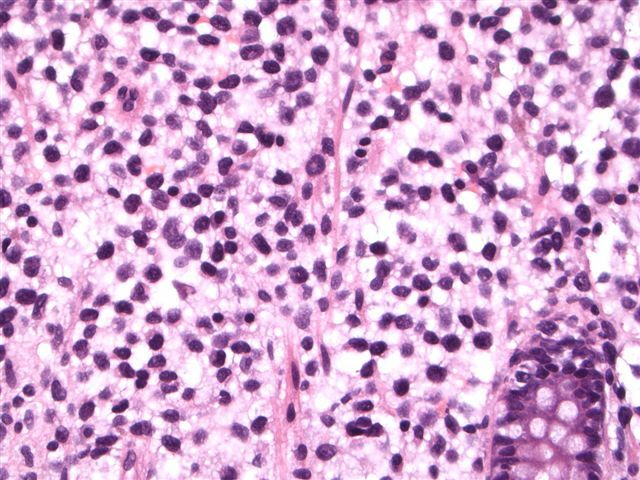 The distinctive hairy cell is seen in bone marrow biopsies.� It has clear to lightly eosinophilic or basophilic cytoplasm, with surface projections that may be delicate or broad.� There may be cytoplasmic vacuoles or azurophilic granules.� The nuclei are oval or indented.� Formalin fixed tissue often has a perinuclear halo. The differential diagnosis includes splenic marginal zone lymphoma and mastocytosis.� Splenic marginal zone lymphoma, like hairy cell leukemia, typically involves the spleen, and may have circulating cells with abundant cytoplasm and cytoplasmic processes.� In contrast to hairy cell leukemia, the cytoplasmic processes are usually polar, not circumferential, and there is a nodular pattern of splenic white pulp involvement, not obliteration of the white pulp.� The cells usually do not express DBA.44, TRAP or CD103.� Mastocytosis often involves the spleen, and mast cells also have abundant clear cytoplasm.� However, they are negative for B cell markers and positive for toluidine blue, Giemsa, tryptase and CD117. Treatment of hairy cell leukemia with purine analogs and interferon frequently causes complete responses and a markedly improved disease free survival (Hematol Oncol Clin North Am 2006;20:1153).� Due to frequent aberrant staining, it is important to order an adequate number of immunostains, and to correlate histologic, immunohistochemical and clinical findings to ensure the correct diagnosis.